I was a little late to the Mule Party because I was under the most mistaken impression that Mules were vodka drinks. But once I tried one with gin, and found a spicy ginger beer (that comes in diet!) … well, it’s now a favorite. 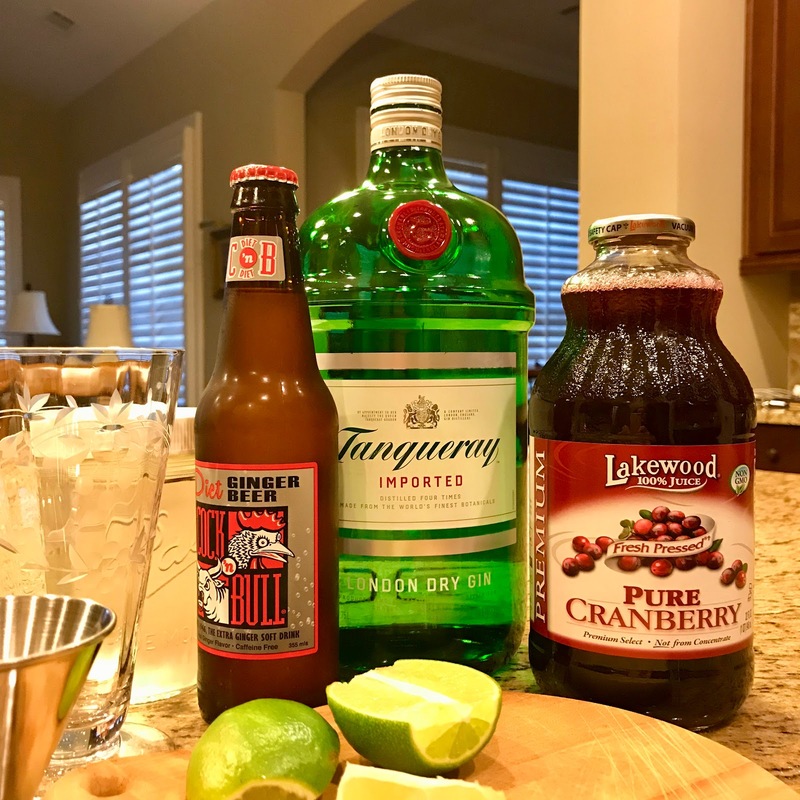 For warm weather mules, I use lemon juice, gin and ginger beer (the classic recipe uses lime juice, vodka and ginger beer). With the holidays approaching, I started looking for something that wasn’t quite so citrusy. 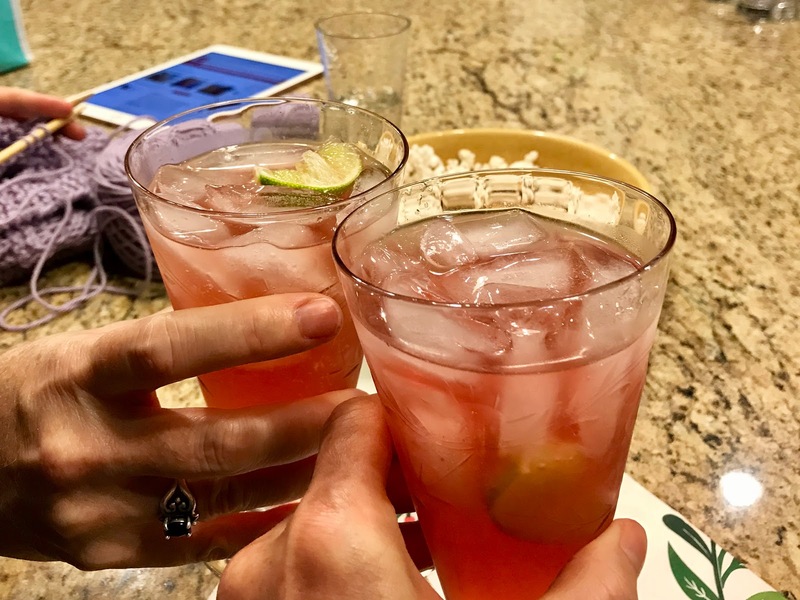 I found a delicious recipe that uses apple cider in place of some of the citrus (of course I substituted gin for the vodka, but I kept the lime). And then I started looking for one with cranberry. This one fit the bill – and it’s so pretty! – but it was too sweet (and I never even made those sugared cranberries). I tinkered a bit and tried out my much simpler version with Karen this week. We agree – it’s a winner! Fill a glass with ice. Combine first three ingredients, and pour over ice. Top with ginger beer. Squeeze in the lime wedge and then it add to the glass. Stir just to combine. *I like a not-so-sweet syrup – 2 parts water to 1 part sugar. Once the sugar has dissolved, I take the pan off the heat and add a few rosemary sprigs. Once the syrup cools, I remove the rosemary. This syrup keeps in the refrigerator for weeks. It’s also quite nice with prosecco and little splash of spiced pear liqueur. Throwback Thursday | Cooking Thanksgiving. I bet that's a great combo of flavors! The cranberry flavor will carry me right on through Christmas. This cocktail sounds easy and delicious! I hope you had a lovely birthday, Mary! The last time I got ginger beer at the liquor store it turned out to be alcoholic; I only drank one of those mules. Maybe you need copper mugs for Christmas! Ooo! This sounds so good! Yum! Thanks for your simple syrup recipe too…usually too sweet for me, but this sounds great! The color looks very holiday-ish, and the mix of ingredients sound delicious! I seemed to have missed your birthday, so here I am late, wishing you a very happy birthday, Mary!!! Hope you had a lovely day! MMMMM sounds yummy and I bet the cranberry juice-not sweetened really gives it a nice tart note. That looks so good!! Cheers!